©THE36THAVENUE.COM DO NOT COPY, PASTE, OR SAVE THIS COLLAGE IMAGE. Hello friends! I have to share with you guys our latest favorite treat! 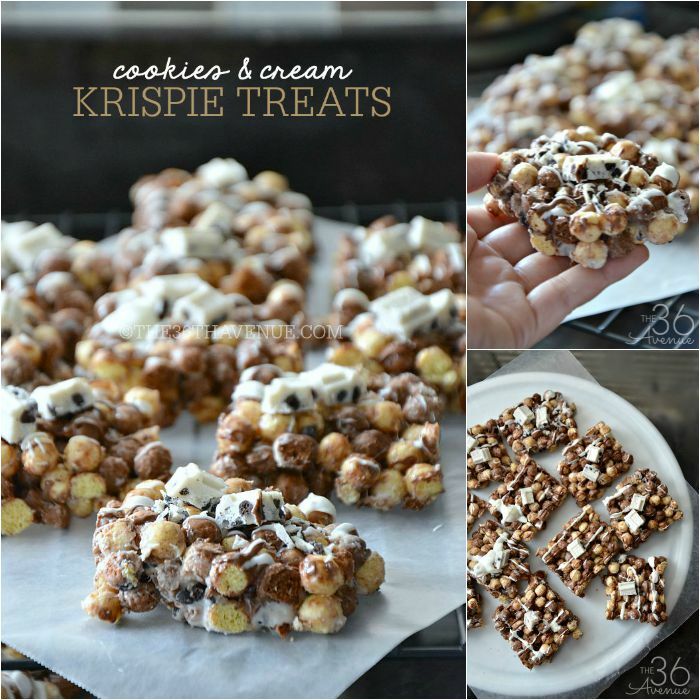 These Cookies and Cream Krispie Treats are so darn delicious! This is a super easy recipe, it takes just ten minutes to make, and they are perfect for get togethers, play-days, after school snacks, and parties. I love that my kiddos can help me make them! We love eating these Cookies and Cream Bars with a cold cup of milk… So yummy! 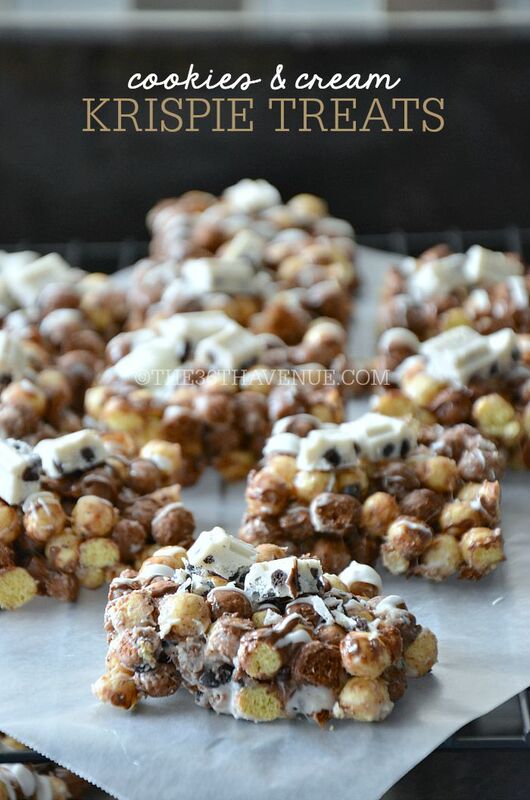 I warn you these No-Bake Bars are a bit addictive… We could not stop eating them! 8 to 9 C. Hershey's Cookies 'n' Creme Cereal. Chop the Hershey's Cookies 'N' Cream Bar into 1 inch pieces and put aside. Remove from heat and add cereal, ½ C. white chips, ½ C. Chocolate Chips, chopped Hershey's Cookies 'N' Cream Bar, and stir to coat well. Tightly press mixture onto wax paper or greased pan. In two separate bowls melt the remaining ¼ C. Chocolate Chips and ¼ C. White Chips in the microwave. 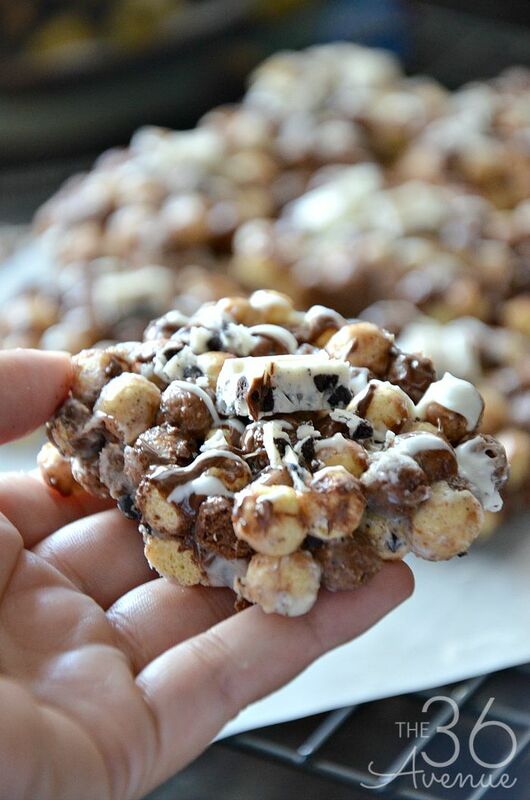 Use a knife to drizzle the melted chocolate on top of the krispies. 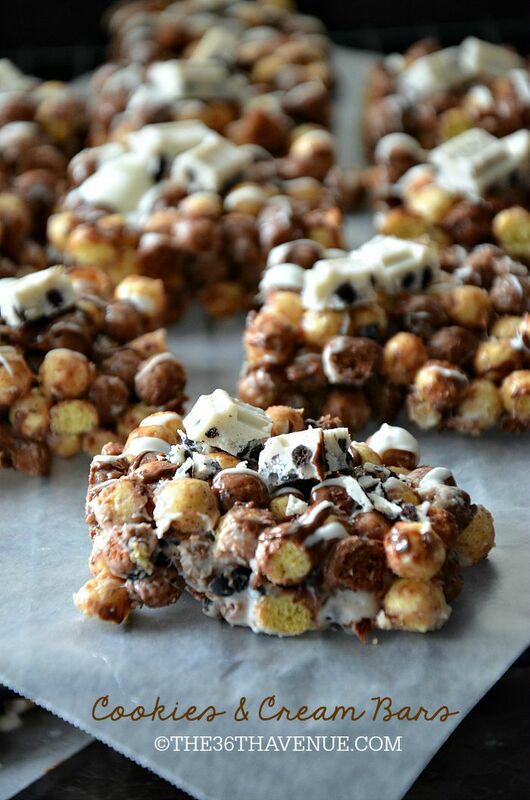 OPTIONAL : You can top each bar with an extra piece of Hershey's Cookies 'N' Cream Bar square. Here are some other easy recipes that our family loves!